On An Overgrown Path: Radio 3 loses 14% of its audience - how dumb is that? Radio 3 loses 14% of its audience - how dumb is that? No apologies for returning to the UK radio audience figures that were published today. The headline data shows that BBC Radio 3 lost 2.1% of its audience in the same twelve month period that Classic FM increased its audience by 2.4%. Now more detailed data has emerged showing that the Radio 3 Breakfast programme, which has been specifically dumbed down to target Classic FM with vacuous listener tweets, a classical chart, bleeding chunks, banal DJ chatter etc, has taken the biggest audience hit. 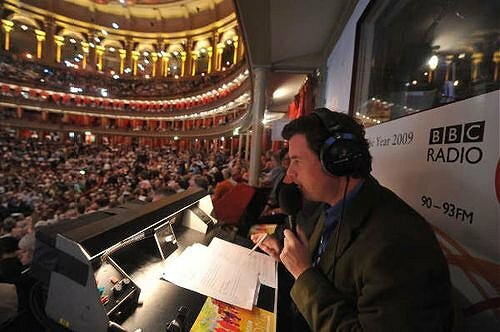 In fact Radio 3 Breakfast lost a staggering 100,000 listeners - 14% of its audience. You don't need to be mathematician to work out that a 14% audience loss in an area of extreme dumbing down and a 2% audience loss overall means there must have been some substantial compensating audience gains in non-dumbed down programme areas. Which blows the whole Radio 3 strategy of chasing audience by dumbing-down out of the water. That is Petroc Trelawny above at the Proms, he presents Radio 3 Breakfast with Sara Mohr-Pietsch. Crowd driven euphoria surrounding Wagner at the Proms must not be allowed to mask a very serious management crisis at BBC Radio 3. My embedded blogging colleagues have kept remarkably quiet about what must be one of the biggest classical music stories of the day.